Before General Motors ploughed countless millions of dollars in, Daewoo was a company producing some modest but effective tackle. When the budget went up, so did the expectation. The Lacetti was the first new car produced by Daewoo under the stewardship of General Motors but it arrived too late to save the ailing Korean marque. GM rebadged the Lacetti as a Chevrolet and, in so doing, gave it a second chance at success. The Station Wagon (American for estate) version we take a look at here was a constituent part of the quiet success story the Lacetti has become and used examples are now around in reasonable quantities. Here's what to look for. For a car that's only been around since January 2005, the Chevrolet Lacetti Station Wagon has certainly accrued an interesting history. Unlike its hatchback siblings, the Station Wagon has always been badged a Chevrolet and didn't undergo the rather confusing badge-engineering process that metamorphosed those cars from Daewoos into Chevrolets. This has allowed the car to be sold through Chevrolet's extended sales network, which encompasses over ninety countries worldwide, one reason why the marque builds one car every seven seconds. In fact, one car in every sixteen sold worldwide is a Chevrolet and over 175 million of them have been sold to date. Targeted products that are right for key markets have replaced Chevrolet's old 'one size fits all' philosophy, hence the Station Wagon's European look and feel. Two engines were offered: a rather vanilla 1.6-litre petrol unit from the start and a peppier 1.8 from Summer 2005. If ever a car was crying out for the fitment of a competitive diesel powerplant, the Lacetti Station Wagon was it. A used Chevrolet Lacetti Station Wagon is never going to be a glamorous choice but what it does it does well. Once upon a time 'styled in Korea' meant a car whose looks could curdle milk but the Station Wagon is a different proposition. 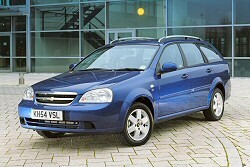 Credit for the estate conversion goes to the Chevrolet design centre in Bupyong and they've done a very effective job. We can all think of estates that resembled saloons which had reversed into somebody's conservatory but take a walk around the Station Wagon and you'll be amazed at the cohesiveness of the design. Of course it helps that the existing lines of the Lacetti with its rising hipline lend themselves well to an estate conversion but the stylists attempted to give this estate a little personality of its own. The chromed grille takes a little getting used to if you're accustomed to the front of four and five-door Lacetti models, while the rear lamps are stacked vertically, thus ensuring a decent wide hatch. The loading bay is generously proportioned, this most modern of estates subscribing to the old school 'more is better' philosophy when it comes to hauling ability. Standard equipment includes alloy wheels, preparation for trailer connections, rear seat heating ducts, a rear seat coat hook and a space saver spare tyre. There's 400 litres of space available with the rear seats in place but a whopping 1,410 litres available should you drop them down. The rear bench features a 60/40 split for added versatility and there's an auxiliary 12v power supply in the luggage bay. Plus there are no fewer than 25 individual storage spaces. There's also generous headroom for the driver and front seat passenger and the legroom in the rear is among the best in class. If you're in the market for an estate that's not as small as its price suggests, the Lacetti has a decent claim on your attention. To date, no significant faults have been noticed with the Lacetti. In order to get the best from the warranty package, check to ensure that servicing has been carried out at the specified intervals. Good showings in the JD Power customer satisfaction survey bode well for used buyers. (approx based on a Lacetti Station Wagon 1.6 SX) Parts are a little pricier than from mainstream manufacturers but given that Chevrolet is part of General Motors, you should expect to see affordable spares prices. A clutch assembly will be around £70 and an air filter should be close to £8. Brake pads are around £17 a front set with a cam belt relieving you of £30. The entry-level SX model is fitted with a 109bhp 1.6-litre petrol unit but in the Sport you get Chevrolet's familiar 1.8-litre 122bhp engine which is capable of a 9.5s 0-60mph sprint along with a 120mph top speed. The 1.6-litre unit will get the car to a respectable 116mph and yet will also return a combined fuel economy figure of 34.5mpg. The suspension has been set up in tune with European requirements. Heavily disguised test 'mules' bashed the UK's highways and byways for thousands of miles in order to optimise the damper, spring, bush and anti-roll bar settings as well as the steering feel. The UK set up is more suitable for high-speed motorway driving as well and body roll has been reduced when cornering. The power steering system has, as a result, been thoroughly revised with a tougher torsion bar and a beefier pump tuned to give more feedback. Wafting through downtown Seoul is one thing, but when you're in the cut and thrust of a UK city, you need a bit of information coming back through the wheel and the seat of your pants. Therefore we get firmer damping to cut out bounce, stiffer springs and a bigger gauge anti-roll bar. Tyres were also an integral part of the equation and the Station Wagon's rubber features a stiffer sidewall to complement the sportier suspension. It's a livelier steer than you may expect. 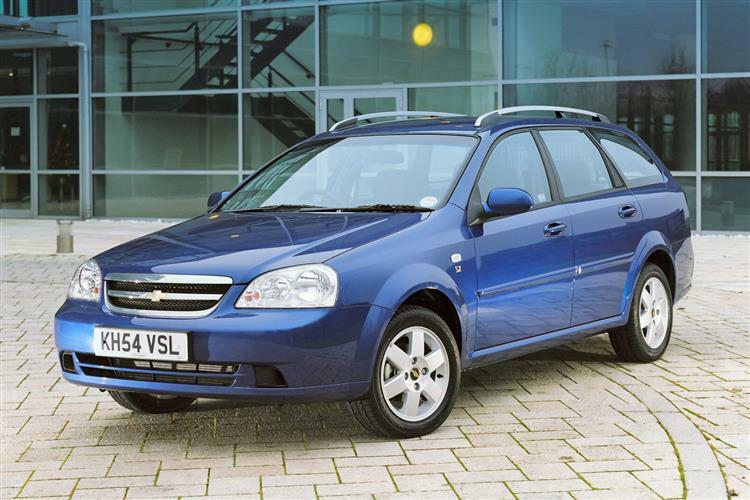 The Chevrolet Lacetti Station Wagon remains one of the least obvious choices if you're shopping for a compact estate but it's well worth investigating. With a decent reliability record, affordable pricing and a decent warranty from new, these cars will usually escape the thrashings meted out to rivals. It does the simple things well and for the sort of traditional estate car buyer who values practicality, that's usually good enough.